Days before the Nov. 6 election, when local rent control Measure M would fail to pass, and while both campaigns were still in full swing, Students United with Renters (SUR) protested perceived racist tactics used in the campaign against Measure M.
About 40 protesters marched on Nov. 2 from Pacific Avenue to Cathcart Street, chanting “Hey hey, ho ho, racist slumlords have got to go” among other messages, while distributing Yes on M flyers. Announced as “the March Against Racist Slumlords,” the protest met in the afternoon at the Clock Tower in downtown Santa Cruz. “SUR is marching today to draw attention to who is funding the No on M campaign,” said Jessica Chuidian-Ingersoll, an SUR organizer. Measure M supporters control the corner of Cathcart Street and Pacific Avenue and hold stakes there while chanting for Yes on M. Photo by Christina Bulosan. 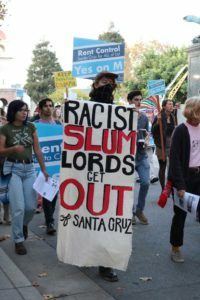 SUR addresses Santa Cruz’s housing issues in the form of education and direct action. It began out of the No Place Like Home Project, which studies living conditions of renters in Santa Cruz County. 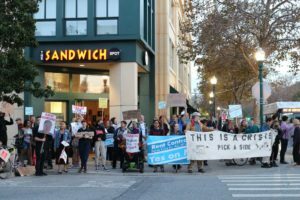 The group specifically protested in response to flyers circulated in Santa Cruz on Oct. 18 by Darius Mohsenin, a landlord in Santa Cruz County. Mohsenin distributed flyers with an image of people assumed to be affiliated with the gang MS-13 beneath the statement “Meet Your New Neighbors.” The same image is often used in fear-mongering tactics by right-wing groups. A masked demonstrator holds a sign up demanding that “Racist Slum Lords Get Out of Santa Cruz.” Photo by Christina Bulosan. Aside from his flyers, Mohsenin’s behavior has been an issue of concern for SUR. The group listed past actions as reason for protesting, citing instances where he posted misleading information about Measure M and insensitive and inflammatory comments to Facebook. Renters Albert Brett and Donna Robles protested Mohsenin’s behavior too, hoping to raise awareness around unjust landlord policies. On Friday, Mohsenin arrived at the protest and met SUR at Cathcart Street. While there, he claimed the issue was not about race and wanted to discuss housing policy. To address the housing crisis, Mohsenin wants Santa Cruz to establish Junior Accessory Dwelling Units (J.A.D.Us) and use a parcel tax to create government subsidies for renters. J.A.D.Us are small living units created out of a household’s existing bedroom. Campaign for Measure M organizer Zav Hershfield did not disagree with the idea of accessory dwelling units, which might increase housing availability. He also did not oppose Mohsenin’s idea of a parcel tax, which would tax property owners based on specified property units. However, Hershfield was confused by Mohsenin’s “too expensive, too extreme” view, arguing rent board costs in Santa Cruz are feasible. Likewise, he did not see how the measure was extreme, stating Measure M matches the rent control policy of other cities in California. He added addressing unaffordable housing requires a multipronged solution.